If you existed anywhere in the blogosphere in late 2010 or early 2011 then you already know about this awesome book. Want to know more about the author behind it? Read on! I feel like Across the Universe is pretty solidly set in the sci-fi/dystopia genre. Is that your niche? Would you ever consider writing something fantasy, or even contemporary fiction? Actually, I've mostly written fantasy--sci fi was a total departure for me! I believe the next thing I write will be fantasy...but I can definitely see myself coming back to sci fi in the future. Well, you're a sci-fi natural. What is your most defining trait? I think it's my empathy. I tend to be very positive and think the best of people--mostly because I can usually see where they are coming from and why they are doing what they do. Oi. I could do with some of that. I'm WAY too much "my way or the highway." If you could only smell one scent, which scent would you want it to be? Lemon-Lavender Yankee Candles. I adore that scent. Mm! I LOVE lemon. I've never heard of Lemon-Lavender, though. Sounds good! If you could spend your birthday inside of any book, which book would it be and why? Any of the Narnia books! I want to live in Narnia!! You're the second author I've asked this two and you gave the same answer! I don't understand it. Narnia is so scary! 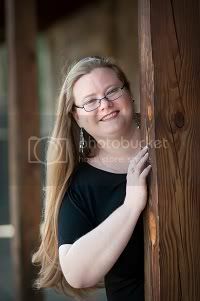 Speaking of scary, imagine that you answered a knock at your door and found Elder standing there. What would your first reaction be? I would probably crap a brick, LOL! That would... hurt. Let's move on. Mad-lib time! I force myself into the picture of green. If I have learned one thing from Eldest today, it is this: Losing my koi fish wil make me look foolish and childish. Instead, I speak slimey, pretty, and sleepy, as if I were writing something very simple. Eldest's notebook runs pale, then purples. Today's giveaway is hosted by the lovely Pica of Pica Reads! And, you guessed it, it's a copy of Across The Universe! Get over there and enter! Great interview! Living in Narnia would be cool. I have heard mixed things about this book, so I've been afraid to check it out myself. But I guess if I got it for free, it wouldn't be too much of a commitment. Yes, Narnia is just awesome!! I am with you. Narnia is a bit scary! I would love to live in Narnia (but mostly if I was a queen). Awesome interview and this book looks amazing! Lemon- Lavender? Never seen it before but I will totally check it out next time I'm at Yankee! Thanks for the interview. Yes! Beth and I would live in the same world! I love Narnia. I also love Beth, so that works out great. I got to meet her last week, and I can just here her accent while reading her answers. BY THE WAY, everyone should read Across the Universe!! It is FANTASTIC!!! funny how she changed to sci-fi and got published. Best of writing luck to her in the future. We definitely do need more sci fi out there so I hope she does try to give it a go! I would also love to visit Narnia. I reread those books every year or two - love them. And I loved Across the Universe. It didn't feel very much like sci-fi to me. More dystopian, I think, but on a spaceship. Either way, I couldn't put it down. I love Yankee Candles too. Except I love the Black cherry soo good. Nice interview. I have been meaning to read this book for awhile now. I would like to live in Narnia also. It might help me get over my fears of some animals lol. Beautiful cover. Absolutely beautiful. Oh, and I can't wait to read the book. Love the concept of this book. LOVE Across the Universe! Totally cant wait for A Million Suns :D Great Interview! 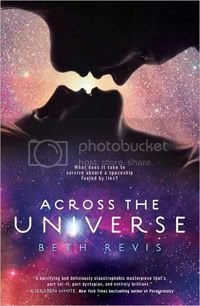 Across the Universe sounds great, and the cover is so gorgeous! Thanks for the interview, Beth--it was fun to get to know you a little better! Wonderful interview! And I'm betting her empathy helps her to create and love characters of all sorts. i'm not a big fan of dystopia's but this is one that i really fell in love with!! This book looks amazing! Thanks for the opportunity to win it! Hmm. I think I posted the comment for this in the wrong comments. 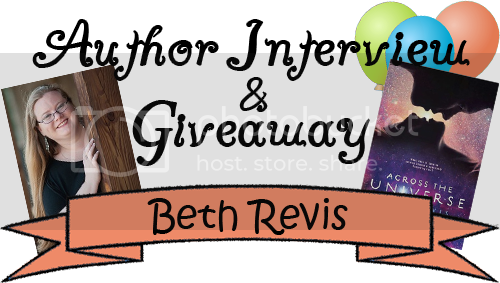 I love Narnia, and Beth's blog is awesome.